Covering all of our great state, Michigan Agri-Systems provides crane service for all those high reaching places. Whether you have a farm or a processing plant and need crane service for construction, maintenance, or repairs, if it’s up in the air, you can trust that we’ll be there. Whether you need complete grain system construction or a simple repair on high, no job is too big or too small (or too high). We have a variety of cranes to serve a variety of needs. If you need crane service for construction, maintenance, or repairs, we have a crane that will meet your needs. 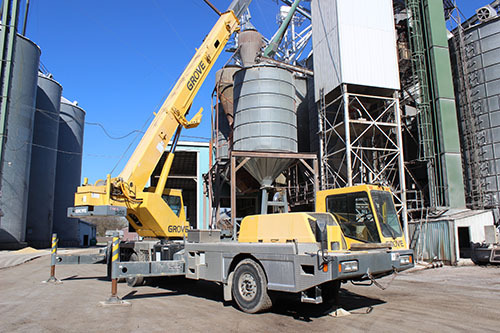 Contact us toll free at (800) 370-4884 or visit us at 5597 S. Huron in Pinconning to learn more about crane service from Michigan Agri-Systems for your farm or processing plant.